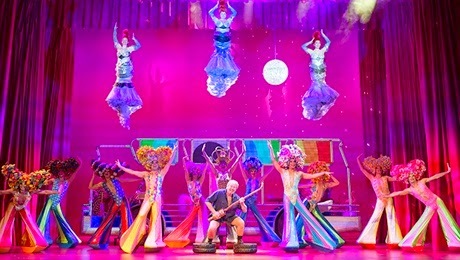 If you're looking for an evening of fun and laughter this Christmas and New Year, make sure that you head down to the Edinburgh Playhouse to see Priscilla Queen of the Desert the Musical. Priscilla Queen of the Desert is the story of three drag queens; Tick/Mitzi (Jason Donovan), Adam/Felicia (Adam Bailey), and Bernadette (Simon Green) as they drive through Australia from Sydney, the Drag capital, to Alice Springs, where unknown to Felicia and Bernadette, Mitzi’s wife Marion (Naomi Slights) and his estranged son Benji (Jamie Field/Connor Paton) reside, in order to perform their drag show at Marion’s casino. Travelling on their bus named Priscilla Queen of the Desert, the way the trio, with their contrasting personalities, make their way through the desert, and find themselves faced with an array of strange encounters which lead to some beautiful moments (including that of the charming relationship between Bernadette and Bob the mechanic (Gavin Mitchell) but of course there's also some hiccups. Priscilla Queen of the Desert the Musical is a feel good hit complete with iconic songs from across the decades (from the likes of Tina Turner, The Pet Shop Boys, Bananarama, Earth, Wind & Fire and Donna Summer to name a few), and some crazy but fantastic costumes. You will find yourself rolling in your seat with laughter at both the principle cast and ensemble cast, who are equally incredible and talented. 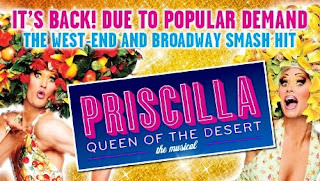 Priscilla Queen of the Desert is one of my favourite musicals for ensemble casts, as they are present for the majority of the show and are in my favourite musical numbers. You’ll be struggling to stop yourself from singing along with them, and tapping your feet. Priscilla, herself, is a bus like no other with her lavish interior, she owns the stage, and it made me wish that I could join Tick, Felicia and Bernadette on the road. The show also contains many humorous cultural references and fans of Jason Donovan and Neighbours in particular, will enjoy Tick’s opinion that he did always prefer Scott to Charlene. While I much enjoyed act two more, a stand out number was ‘I Love The Nightlife’ in act one. After being refused service in a bar, and getting some strange looks to say the least, local lady Shirley, played by Scottish comedian Karen Dunbar is won over by the three drag queens in a hilarious performance. Dunbar had the audience in fits of laughter with her perfect comedic timing. The three divas played by Lisa-Marie Holmes, Laura Mansell and Catherine Mort left me in awe with their insane vocals. Jason Donovan perfectly captured the essence of the lovable Tick, conveying his endearing personality and genuine warmth. Simon Green as Bernadette was sophisticated, elegant and classy, everything I aspire to be when I grow more mature, and finally, Adam Bailey as Felicia is showstopping. You’ll find yourself falling in love with the three fascinating drag queens and you’ll be wishing you were adventuring through Australia with them. If you are looking for some excitement this festive season, you should definitely make going to see Priscilla Queen of the Desert a top priority, otherwise you will regret it! Priscilla Queen of the Desert the Musical is at the Edinburgh Playhouse until 2nd January. Tickets and information.